Best Uses For Hidden Security Cameras | Calgary Alarm Inc.
Security is a pressing matter these days and while security systems are increasingly being used, hidden security cameras are the most used. Hidden security cameras come with a range of features, including portability and night vision, making them well suited to being used in a wide variety of settings. Here are some of the best uses for hidden security cameras. You never know who may be trying to scope out your home at night or who has stolen something off of your property, making a hidden camera extremely valuable for homeowners. The benefit of having a hidden security system with night vision is particularly valuable. To ensure that employees are not engaging in employee theft, a hidden camera is a good way to monitor the behaviour to prevent this. This is a smart business move that could lead to substantial savings. It is not uncommon for cleaning staff and even hotel visitors to gain entry to your room while you are away and take all of your valuables. A hidden security camera, however, will have a record of the perpetrator. At events that have a lot of people (such as weddings), it is not uncommon for theft to occur. Having a hidden camera placed around the premises can provide you with the evidence if money were to go missing or an act of vandalism were to occur. 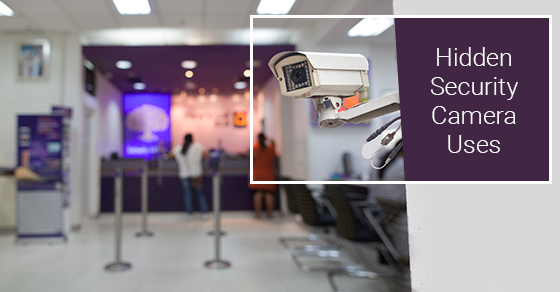 Hidden security cameras can also monitor unauthorized access to restricted buildings. It is in every parent’s best interest to have a hidden security system in their home if they have hired outside help to watch over their children — this is especially true if you already have concerns with a person you have hired to care for your children. There are a variety of personal reasons in which a hidden camera could be useful. For example, it could be used to monitor a reckless or rebellious teenage who has a history of engaging in unwanted behaviour such as drug use. Similarly, it could be used to monitor any suspicious behaviour from your spouse, who you suspect may be having an affair.